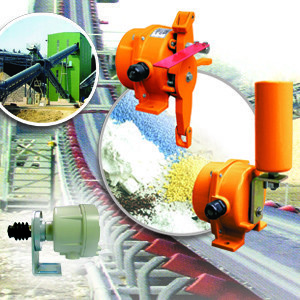 Categories: Belt Conveyor Safety, Solids. The SRS/SRT/ED belt conveyor safety products work to ensure and protect equipment and personnel. The SRT is designed to be used for monitoring hazardous conditions of conveyor belt misalignment during normal conveyor operation. As one of the belt conveyor safety products the SRT activates two alarm outputs when misalignment is detected, an alarm notification output and safety shutdown output. The SRS is another of the belt conveyor safety products, this is a safety stop switch designed to provide a switching system to disconnect power to a conveyor system or other process equipment in the case of an emergency condition. A coated steel cable can be used to activate the stop switch from long distances. 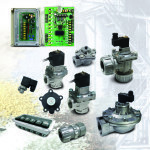 The SRS cable stop switches can be placed and mounted on long distances of belt conveyors. The ED series is another of the Aplus Finetek belt conveyor safety products. The ED is a speed monitoring safety instrument for use in monitoring the speed of rotating devices such as rotating conveyor shafts, motor shafts, etc. The ED speed monitor will measure RPM from 1~999rpm and indicates speed on its internal display. The primary output is a 4-20mA analog signal of the measured speed that can be tied into a PLC or DCS or panel meter. An alarm relay output is also provided. The BRD/BDV series are used specifically as dust collector valves in dust collector systems. 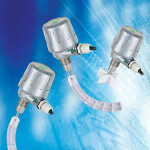 Each valve consists of two air chambers divided by a diaphragm. The two models, BRD and BDV, perform the same function with slightly different designs. They are used to provide a sudden burst of air pressure into dust collector filter bags for cleaning purposes. The AE series is a product line consisting of several dust collector controllers used to sequence and control the operation of the dust collector valves. The SE3 Series compact rotary paddle point level sensor is a bulk solids bin level indicator or level switch that uses a robust synchronous drive motor to rotate a stainless steel shaft at approximately 1 RPM. It is small and compact, a great choice for installations with limited space.